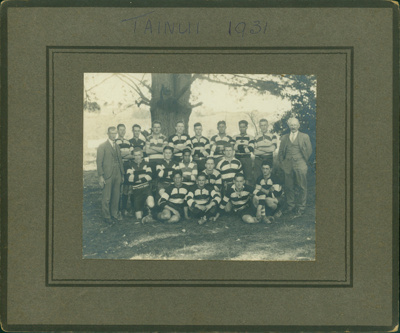 Rugby team photograph mounted on card. Title reads "Tainui 1931". Shows team in uniforms under a tree. Names of those present: Back row - E. (Ted) Rattenbury (in suit), unknown, Stan Roberts, unknown, unknown, unknown, K.P. Wetere, unknown, A.H. (Bert) Rattenbury Jnr. Second row - R.J. (Reg) Rattenbury, unknown, unknown, unknown, unknown, A.H. Rattenbury (in suit). Front Row - all unknown. Tainui 1931 written above the photograph on the matt board.